I have an unusual family. Allow me to explain before any family members reading this get offended. We are unusual because we’re so, well… normal. Take my dad’s side of the family. He is one of six children. That generation married and had kids, so my cousins and siblings and I total eighteen. Now our generation is getting married and having kids, and so far there are thirty and counting in the next generation. Here’s the thing- of all of us, there are no black sheep, no rebels, no skeletons in the closet, and all of us get along- no family feuds or rifts or anything. And we are all actively living out our Christian faith. Now imagine what would have happened had my grandparents not raised their children to know Jesus. What would have happened if they hadn’t made church a priority, both on Sundays and at home throughout the week? Think of the difference they made in the lives of generations to follow. Counting spouses, that’s roughly seventy people so far. If my grandparents hadn’t passed on their faith, that’s seventy fewer people active in the kingdom of God. Parents, take note of this. You are affecting countless future generations by your example (or lack thereof) in teaching the Christian faith. Yes, children can grow up and decide on their own to leave the church, and I know people whose adult children have done just that. It grieves them to no end. But that’s on their children, not on them. And of course you cannot save your children's souls through your own efforts. However, God promises to work through His Word, and you have the opportunity to surround your children with that Word. Teach and live the faith while your kids are at home. Make it so natural that they continue in their own faith when they leave home. So here’s the secret of church growth: the family. Not flashy enough? Maybe not, but it’s true. Think back to your confirmation class. How many of those classmates are still active in church today? To the best of my knowledge, eighty percent of my classmates no longer regularly attend church, and probably haven’t for years. That’s tragic. And I’d bet the statistics from your class are probably similar. Consider how much bigger the church would be if those confirmands who vowed in front of the entire congregation to remain faithful unto death actually meant those vows. Sadly, most of those who have fallen away were those whose parents dropped them off each week for catechism class but never actually went to church themselves. Parents, this is serious business. Do not expect the church to do in an hour a week what you refuse to do in the remaining 167 hours. Kids learn more about the faith by watching you than they will during church or Sunday School. That’s not to say the church is irrelevant. Not at all. But you, parents, have the biggest impact. If church isn’t a priority for you, it won’t be for them either. If you go to church casually and do little at home to pray, learn Bible stories, memorize Bible verses and the catechism, chances are they’ll follow suit. Like I said, this is serious business. So what’s a parent to do? Teach your kids Bible stories from the time they are babies. Read age appropriate devotions with them. Ask them for prayer requests and pray with them often. Teach the catechism so that when they get to confirmation class the memory portion is review. We used to go around the table each night and my brothers and I took turns quoting the Ten Commandments and meanings after dinner. It was invaluable. I still remember them all today. When my dad (a pastor) was teaching confirmation class one day, the confirmands were complaining that they had to memorize the entire Apostles’ Creed. My dad brought in my first-grade brother, who quoted the whole thing without blinking an eye. One student grumbled, “Yeah, well, that’s because he’s in church every Sunday.” Exactly. Play Christian music in the car and at home. I’m a classical church musician, so I want my kids to know the rich hymnody of our church. I play CDs of hymns in the car, and just started doing so with the carpool kids as well. (I’m not sure what the 8th and 9th grade boys think of that, but it’s good for them as well.) CPH has some great resources in this category. They have a Hymns of the Church Year CD that has hymns for all the seasons, sung by children. They have Evening and Morning, a CD that includes the music of the liturgies found in Treasury of Daily Prayer. CPH also has the catechism set to music in a CD called Sing the Faith. Just the other day my friend’s five-year old sang me the meaning of the Third Article of the Apostles’ Creed. Kids have an amazing memory, especially when things are set to music. Use that to your full advantage. Listen to Lutheran Public Radio, a great free resource available on the internet and via app for your phone. Teach your kids these things while they are young. Remember, your faith isn’t just about you. It’s about the next generation, and the next, and all those following. Do everything in your power (with God’s help, of course) to see that the faith doesn’t stop with you. This is the kind of church growth that produces solid, mature Christians. It’s a huge responsibility, but God is by your side the whole way, nurturing each precious soul to grow His Church. Ruth, where did you grow up? How diverse was the population? Did anyone in your family make any effort to reach others who did not reflect your cultural heritage? You see, what strikes me the most about Lutheran doctrine is the fact that it is largely unknown outside of Lutheran culture. That is no one's fault but the current and previous generations of Lutherans, which includes, well, you and your family. As an African American, I am struck by the fact that, even the most famously quoted person to carry the name, Luther, was a BAPTIST preacher. Both he and his father, whatever they thought about the person after whom they took names, did not think enough of the doctrine he proclaimed to embrace it. Why is that? When you look at the demographics of the typical Lutheran (LCMS) congregation, it is amazingly, and sadly, homogenous. I have seen a church close because the area demographics changed, and the church could not absorb the new neighbors. Why is that? It's good that you all had such a peaceful, tranquil, secluded life experience, one which many of your demographic would envy. Given that many of the LCMS believers whom I have met over the last five years are 3rd and even 4th generation Lutherans, it would appear that they were raised similarly, but I only personally know of one multi-generational Lutheran who looks more like "Luther King" than "Luther." I hope that changes with this generation, or the LCMS will die within this century - not Lutheranism itself, thanks to the remarkable growth in Africa - but the LCMS expression of it, because this country is getting browner by the generation, and the LCMS is not keeping up with that trend. Hi Delwyn, thanks for taking the time to comment. You are right that the church's role is to preach the Gospel to all nations as Christ commanded. Yet "all nations" includes our own children, all of whom who need the gift of faith. In addition, it is also the church's role to nurture the faith of those who are already Christian. Both are essential. Spending time in discussion of the one does not undermine the other. I cannot speak for Ruth, but my local LCMS church (despite its rather small size) is constantly reaching out to help the community through its homeless ministry, student ministry, apologetics, and evangelism. These ministries are all wonderful ways to serve our neighbors of every cultural background and hopefully to invite them to join us in church. However, the future and validity of our congregation does not rest on them. The thing that makes us a church is the fact that in our service we gather to receive the gifts of the Sacrament and to hear the pure teaching of Christ's Word. Through God's grace, I hope that my children's faith will be strengthened and maintained through this, just as I hope that more of my neighbors from the community will also share that gift. It is true that many Lutheran churches are not very multicultural. Does that mean the LCMS will die within the century, as you predict? I fervently hope and pray not. No one denomination is assured it will last until the end of time, but God does assure us that He will keep the Church on earth in His care. All true Christians are part of that church no matter what the demographics of any particular congregation happen to be. You touch on an excellent point, and one I made in my follow-up post to this one on my own blog. "The Secret to Church Growth" is intended to encourage parents to bring their children up to know their Savior. 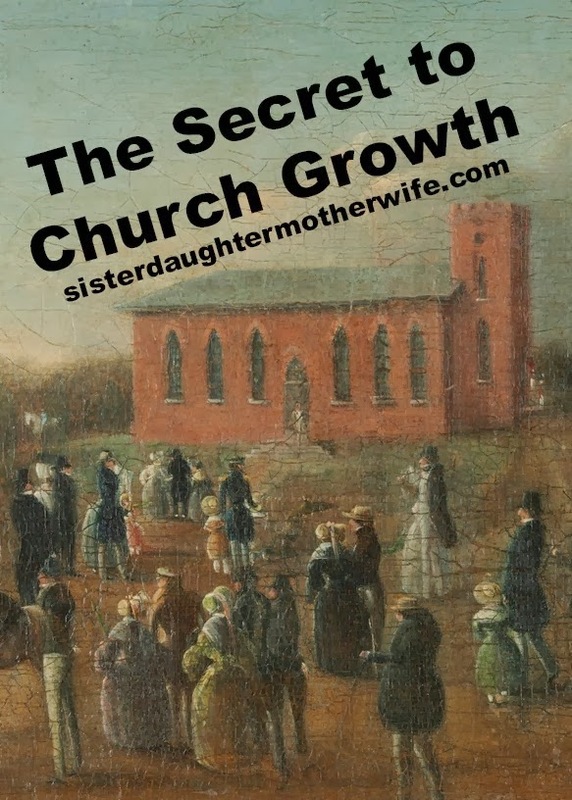 My follow-up to that is "Church Growth 102" (http://truthnotes.net/2014/02/24/church-growth-102/), and emphasizes the point that we can't stop with teaching our kids the faith. All Christians are called to make disciples of all nations, and thus need to invite others to church and witness to others wherever they can. Believe it or not, I invited a couple not in my cultural heritage to church just two days ago. I'm not saying this to brag in any way, but to illustrate that there are Lutherans out here who do reach out beyond our own ethnicity. You made this point: "I have seen a church close because the area demographics changed, and the church could not absorb the new neighbors." That is sad, I admit. But was the church unable or unwilling to absorb its new neighbors, or were the new neighbors unwilling or uncomfortable attending the church? It can go both ways, and probably a bit of both if we're honest. The bottom line to me is that all Christians are called to reach out to those whom the Lord places in their paths, and as parents, that duty must start with our very own children. Martin Luther was a Baptist preacher??? Maybe I`m reading that sentence wrong, please forgive me if I am. I believe he means that the very famous Martin Luther King, Jr, who carried the name "Luther," was Baptist.